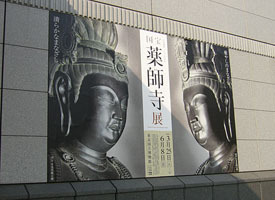 For big fan of ancient Buddhist art, especially for those who hunt National treasures, it was very exciting season and busy to go to museums where hold the exhibition during Golden week holiday. I went to Tokyo National Museum in Ueno park to see the Exhibition of National Treasures from Yakushi-ji Temple. Last week, I went to Shin-Yakushi-ji Temple to see the Twelve generals, and this time, I could see the bronze sculptures of Nikko(日光), means the sun, and Gakko（月光）, means the moon, made in Hakuo period (A.D.672-686) as National Treasures. That’s a good chance that you’ll be able to see the back shot of the sculptures. In most cases, a statue set on the proper place in the hall of temple, you would not be able to see it from behind of it. However, in this exhibition, every statues were standing alone and displayed without their nimbus, besides, there was a deck in front of the Nikko and Gakko so that visitors could see on the same level with both of statues. So I could tell the difference of these looking between the one when I saw on the deck and the other when I could see from lower point. The appearance of Buddha statue changes depending on where you look at it from. I walked around every bodhisattva statue to find out the best view, but it was hard to decide it. As bodhisattva statue twisted the body, so the outlines of the body gradually changed at every step I took. I enjoyed the variety of the lines. At the Kichijouten (吉祥天), is also designated National Treasure, booth, it was hard to see it because a lot of people gathered in front of the Kichijouten picture like a wall. The museum staffs made the visitors move along not to stack in front of it, but the visitors tried to stay there as much as possible. Indeed, it was worth watching. The number of works in this exhibition was small, but almost of them were designated as National Treasure or Important Cultural Properties. It must be rare chance to see them at once, I do recommend you go there. 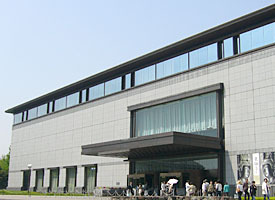 This exhibition is showing untill June 8, 2008. After watching the Exhibition of Yakushi-ji temple, I went to another exhibition whoch was held at the same time in Tokyo National Museum on “The Lantingji Xuin(蘭亭序)”, which is one of the most well-known East Asian style Calligraphy works, but as I was exhausted to see the Yakushi-ji’s works, I couldn’t concentrate on the works of the exhibition “The Lantingji Xuin”. It was a pity that this exhibition will finish on May 6th, but I was relieved to know that another exhibition will be held at Edo-Tokyo Museum in this July named “The Palace Museum. 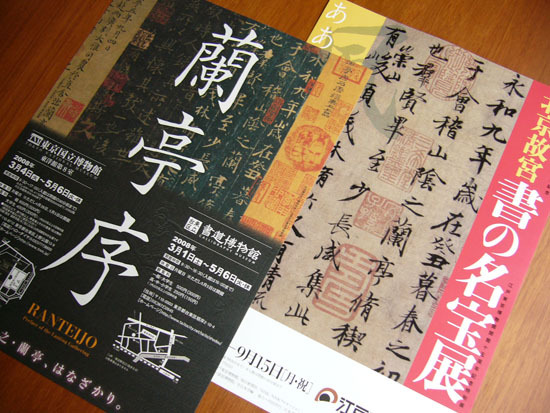 A well-known treasure on Calligraphy” and will display “The Lantingji Xuin” works. I hope to see them again.